Customer loyalty programs are all about keeping your current customers engaged and happy, while keeping a good check on their experience. In fact, according to a recent joint report titled ‘Achieving Big Customer Loyalty in a Small Business World’ by Manta and BIA/Kelsey, 61% of brands reported that repeat customers drive more than half of their revenue, rather than the new ones. Today, consumer’s decision to buy and interact with a brand is often based on the ability of the brand to reward them for the time and money spent. Customer loyalty programs work best when they are intertwined with everyday preferences and needs of your customers. This is where beacons come into the picture. While beacons are popularly known for delivering contextual content, it also allows marketers to have a deeper understanding of their target audience’s behavior, demographics, location and actions effectively. 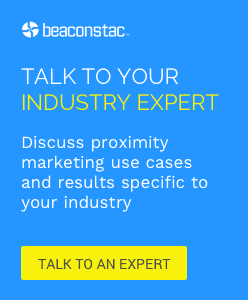 If you are just starting out, our Beacon 101 ebook is a good place to start reading about the iBeacon technology. In this post, we will be discussing in detail on how beacons can help brands take their loyalty programs to the next level. A leading hospitality chain, Marriott International, recently deployed beacons about their hotel premises to push geo-targeted in-hotel discounts and offers from nearby retailers to their loyalty club members. The company revamped its loyalty program by adding two new features – LocalPerks and FlashPerks. While the first one allowed customers to reap the benefits of offers that were available in local neighborhoods, the other one allowed them to use reward points as virtual currency and redeem offers. One of Bay Area’s popular quick service soup, sandwich and salad chain, San Francisco Soup Company, recently integrated iBeacon technology to automatically identify loyalty program members with Bluetooth-enabled smartphones when they are near a specific location. The push notifications that the customers receive are specific to that particular restaurant locale and are customized based on the previous order histories and spending patterns of customers. The highly personalized nature of this rewards program helps SF Soup Company to increase foot traffic and drive sales at their outlets. One of New York City’s dominant pharmacy chain and subsidiary of Walgreen Co., Duane Reade, recently leveraged iBeacon technology at ten of its stores to boost its loyalty program. The company deployed this new proximity-detection technology to keep a track of their customer’s shopping history, wishlist etc., and then use it to push product recommendations based on the precise location of the customer within that store. To learn more about ideas on how brands can use beacons to boost their loyalty programs , read our post on ‘How beacons can help brands take their loyalty programs to the next level‘.